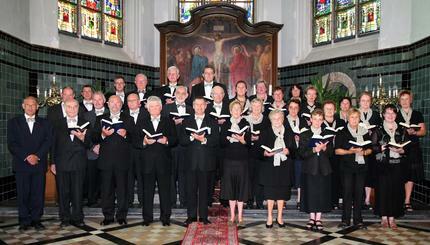 Welcome at the Gregorian Choir Cantica of the Federation Houthulst-Lo-Reninge (Flanders, Belgium). The choir has thirty-six members, men and women and adds lustre to about fifteen celebrations on a yearly base. Houthulst and Lo-Reninge are located in the triangle Ieper (Ypres)-Roeselare-Diksmuide and belong to the diocese of Brugge (Bruges). It is in the nine parishes of the Federation Houthulst-Lo-Reninge that Cantica sings at Mass, but beyond these places we sing in Diksmuide, Nieuwpoort and Brugge (Saint Saviour Cathedral, Holy Blood Basilica) too. Sometimes the choir can be heard at funeral services or during the Vespers as well. Mrs. Rita Vandenbussche is the choirmaster. Her interest for Gregorian music and his unceasing commitment make Cantica put up beautiful performances under her guidance, and allow it always to make progress. Founded in 1999, the Gregorian Choir Cantica consists of people who come together during spare time to learn to know and to study Gregorian chant. Every Monday evening they are faithfully present to practice together.